As the exclusive distributor for DURA WPC products throughout Ireland, Ridgeway offer a comprehensive range of cladding and decking solutions suitable for both commercial and residential projects. Environmentally friendly, colour stable with low life-time cost, they represent an attractive alternative to natural timber but without the maintenance. 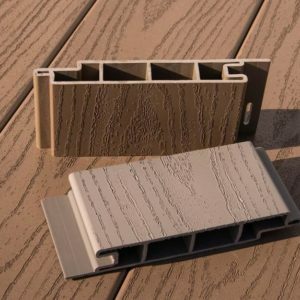 Dura Deck: Strong and durable, Dura Deck composite decking looks and feels just like natural wood but provides a longer-lasting solution that is environmentally friendly, easy to install and requires minimal maintenance. 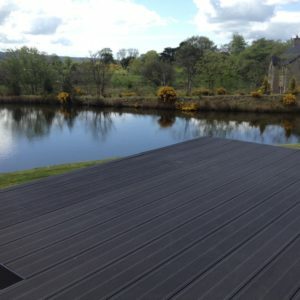 Made from an innovative blend of up to 87% recycled hardwood and plastics, Dura Decking helps to conserve the earth’s resources whilst reducing the amount of waste sent to landfill. 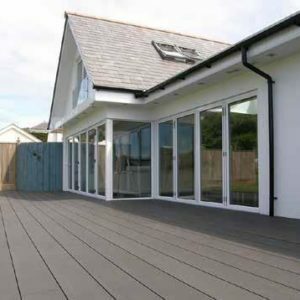 Our Dura Deck is available in two ranges, Eco and Resist. These board types differ in specification and help to suit various budgets and project requirements. The “tried & tested” ECO board range has been redesigned to incorporate an attractive wood grain effect on both the 146 and 295 board types, as well as adding a new colour (Stone) to the range. The recently launched DURAdeck Resist range is our premium offering and incorporates a 360 deg outer armour, offering enhanced protection. The co-extrusion manufacturing process also allows us to offer an even wider colour range to suit all tastes, meaning Ridgeway will now hold 6 different colour options from stock in Belfast and Ashbourne. Dura Cladding: Made using a highly developed extrusion process, with a unique timber and plastic composition. It is manufactured using recycled high-density polyethylene polymers, recycled ground hardwoods and specifically engineered additives. When harnessed together with high performance coupling agents, it will provide a beautiful low maintenance 87% recycled and 100% Certified FSC wall cladding. Dura Cladding also provides a traditional wood cladding appearance coupled with a 25-year design life at a fraction of the maintenance costs of natural wood. Dura Cladding is ideal for commercial premises, display areas, offices and factories. Dura Cladding is quickly becoming a popular choice for the external finishing of commercial and domestic buildings, providing a hardwearing, protective layer against the elements and acting as an excellent insulator. Dura Cladding has a fire/flammability resistance of composition rating to BS EN 13501-01. For more information on the range of DURA Decking and Cladding products we stock please contact a member of our team at either Belfast +44 (0) 2890 454599 or Ashbourne +353 (01) 8027173 or alternatively click the button below to submit your enquiry via email. Keeping the cost of going UP, Down.